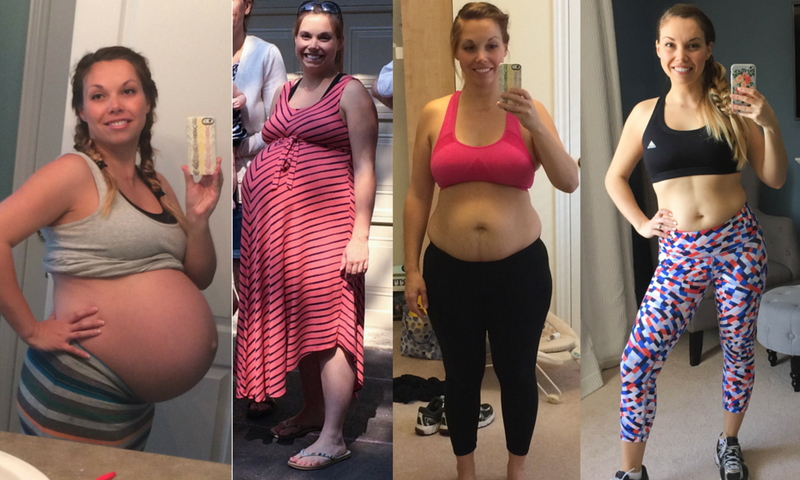 Having three pregnancies, (including one twin pregnancy), has pushed my body to the limit. What has been the biggest casualty? my midsection. I am often asked what my daily workout consists of. Well, to be honest, not a whole lot. I keep it simple and effective. Because I don’t have a lot of time each day to set aside for working out, on top of work and raising four kids, I try to keep my workouts to under 20 minutes in length. Almost all of my workouts consists of strength training, and I make sure I am targeting the areas that need to most work. Although I am close, but have not yet reached my goal, especially with regaining strength and mobility after having my twins, I have to make sure I am always reminding myself how far I have come. But I wanted to share with you my three favourite (and in my opinion, most effective) abdominal workout moves. If someone were to say that I could only do one exercise move for the rest of my life, and I could pick only one… it would be side crunches. This move by far produces the best results in the least amount of time. Any time I have taken a bit of time off from my workouts and jump back into side crunches, I see more definition in my waist in just a few days! Lay facing up with your knees together and bent at a 90 degree angle. Then drop your knees to the left without moving your upper body. Place your hands behind your head and raise your shoulders towards your hips, as if you were doing a sit-up. Pause for one second and then lower your body to the ground. I typically do three sets of 15 reps on each side. 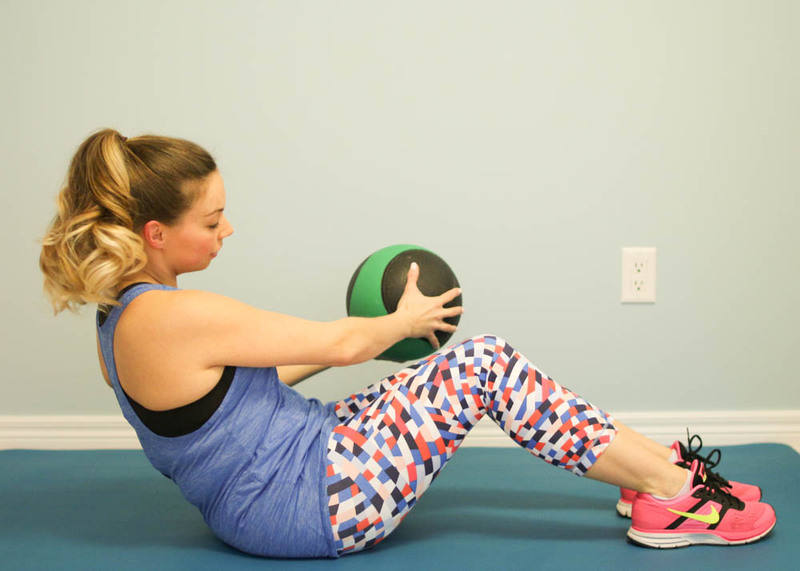 I prefer this crunch over just a regular crunch because I find it works my lower abdominal muscles more, (which after twins, always need attention), and this move is also easy on my back. Lay facing up with your knees and hips bent at a 90 degree angle so that your calves are parallel to the floor. Place your hands behind your head, with your elbows pointed outward. Raise your shoulders off of the floor, (don’t be too hard on yourself if you can’t get too far off the floor, your abs might be weak from your pregnancy… like mine are), and twist your body while you reach your right elbow to your left knee, while you are straightening your right leg. Then return to the starting position and repeat with the other side. I like to aim for about 30-40 reps of this move. I like this move because… well let’s be honest, it gets rid of my muffin top left over from four pregnancies. For a long time I couldn’t seem to find an exercise that would target that pesky spare tire I had hanging around… until I found the weighted Russian twist! Start by sitting on the floor with your knees bent and your feet flat on the ground. 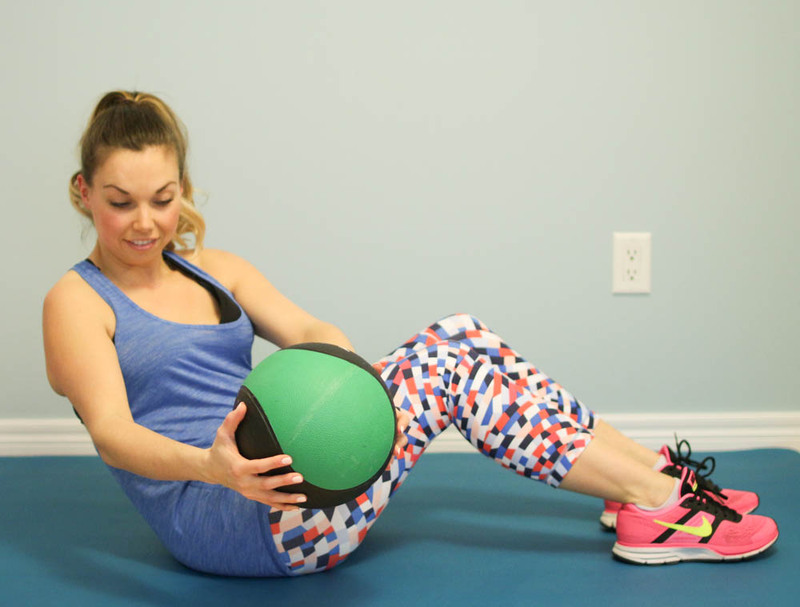 Hold a medicine ball (or a weight plate, or even just your hands together without a weight), straight in front of you. Angle your torso at a 45 degree position, which you will hold for the entire exercise. Rotate your torso to the right trying to hold your arms as straight as you can while keeping your feet flat on the floor. Repeat the motion to your left, again keeping your torso at a 45 degree angle, your arms straight and your feet flat. I like to do 20-30 reps of this move. In the end, I know that my body will forever have a different shape since growing my precious four little humans, and I am really okay with that. It tells my story of where my body has been and who it has created! Before starting any new workout routine, always consult your doctor first. You should not start exercising until at least after 6-8 weeks postpartum and until you have received your doctor’s consent. 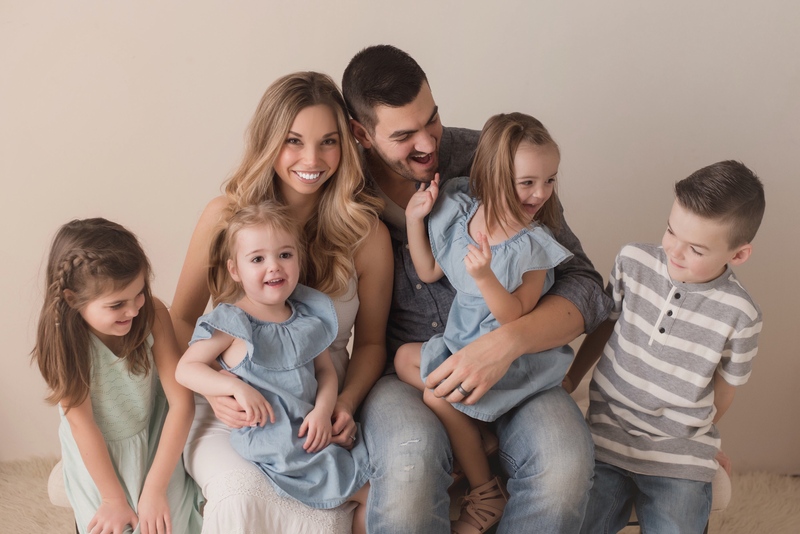 Read more about my body’s journey here: What having four kids (including twins) has done to my body and my confidence. Did you recently give birth? Before starting any new exercise routine, set yourself up for success with these tips: 10 Acts of kindness you should do for your postpartum body before starting a new exercise routine. Don’t forget to follow Nesting Story on Facebook and Instagram for additional tips, articles and before and after photos! 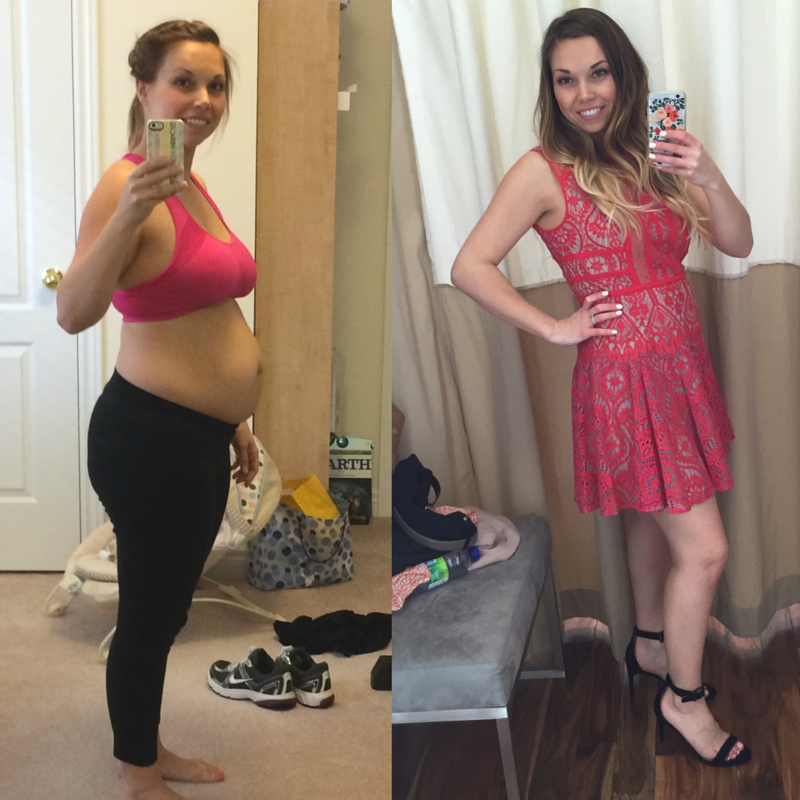 Thank you so much for these ideas – as a twin Mum whose midsection is still a wreck after five years I a really hope to make some progress soon!